ذهاب ناظوری, سمیه, جعفربیگلو, منصور, عباس نژاد, احمد, زمان زاده, سیدمحمد. (1397). مناطق مورفوکلیماتیک و مورفودینامیک کنونی و آخرین دوره یخچالی درکوهستان بیدخوان. پژوهشهای ژئومورفولوژی کمّی, 4(4), 72-86. سمیه ذهاب ناظوری; منصور جعفربیگلو; احمد عباس نژاد; سیدمحمد زمان زاده. "مناطق مورفوکلیماتیک و مورفودینامیک کنونی و آخرین دوره یخچالی درکوهستان بیدخوان". پژوهشهای ژئومورفولوژی کمّی, 4, 4, 1397, 72-86. ذهاب ناظوری, سمیه, جعفربیگلو, منصور, عباس نژاد, احمد, زمان زاده, سیدمحمد. (1397). 'مناطق مورفوکلیماتیک و مورفودینامیک کنونی و آخرین دوره یخچالی درکوهستان بیدخوان', پژوهشهای ژئومورفولوژی کمّی, 4(4), pp. 72-86. ذهاب ناظوری, سمیه, جعفربیگلو, منصور, عباس نژاد, احمد, زمان زاده, سیدمحمد. مناطق مورفوکلیماتیک و مورفودینامیک کنونی و آخرین دوره یخچالی درکوهستان بیدخوان. پژوهشهای ژئومورفولوژی کمّی, 1397; 4(4): 72-86. شواهد ژئومورفولوژی یخچالی در مناطق کوهستانی نقش بسزایی در شناخت وضعیت اقلیمی گذشته و بازسازی شرایط مورفوکلیماتیک و مورفودینامیک حاکم در کواترنری پسین دارد. هدف این پژوهش، تعیین و بازسازی مرزهای مورفوکلیماتیک و مورفودینامیک در آخرین دوره یخچالی وورم و شناسایی مرزهای این قلمروها در کوهستان بیدخوان می‌باشد. به این منظور، از روش‌های توصیفی و مطالعه‌ی کتابخانه‌ای، بازدیدهای میدانی برای شناسایی اشکال و درنهایت روش تحلیلی استفاده‌شده است. نقشه‌های توپوگرافی1:25000 ، عکس‌های هوایی منطقه به مقیاس 1:55000 سال 1334 و 1:20000 سال 1344 و داده‌های اقلیمی دما و بارش ماهانه و نرم‌افزار Arc GIS 9.3ابزارها و داده‌های مورداستفاده در پژوهش هستند. 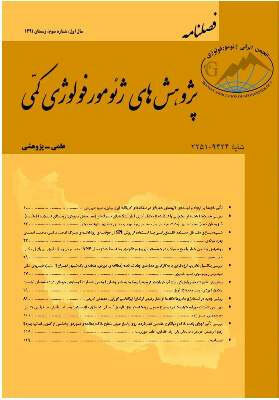 در این راستا، با استفاده از عکس‌های هوایی و بازدیدهای میدانی، تعداد 32 سیرک در منطقه شناسایی شد. سپس از میان روش‌های پنج‌گانه پورتر برای بازسازی خطّ تعادل برف و یخ گذشته، روش ارتفاع کف سیرک برای برآورد حد برف مرز آخرین دوره یخچالی استفاده‌شده است. نتایج نشان می‌دهد در حال حاضر مرز پائین قلمرو قاره‌ای خشک به‌طور متوسط در ارتفاع 3150 متری، قلمرو نیمه‌خشک ارتفاعات 2500 تا 3150 متری را شامل می‌شود. بر اساس مرز برف تعیین‌شده در آخرین دوره یخچالی کواترنر حد پائینی قلمرو مجاور یخچالی 3166 متر می‌باشد که منطبق با برف مرز پیشین می‌باشد و ارتفاعات کمتر از 3166 متر تحت قلمرو قاره‌ای خشک بوده‌اند. In order to study the development of mountainous areas, researchers try to determine the snow-lines in glacial and inter-glacial periods. Bidkhan mountain is located in the southeastern part of the central Iranian volcanic belt (i.e. Sahand-Bazman zone) in 29˚ 35 to 29˚ 40 northen latitude and 56 ˚ 25 to 56˚ 30 eastern longitude. Glacial and periglacial processes were effective in changing Bidkhan mountain morphology. Here we seek the relationship between these morphological features and current morphclimatic regions and climate change . Research methodology is descriptive and analytical. Data have been collected in two ways: from library to study the theoretical basis and research background, and in field to control basic maps information, and to identify landforms. To obtain necessary data for this research topographic maps of 1:25000, Landsat image Tm30m, Aerial photos:1:55000 and monthly precipitation and temperature data of synoptic station in Baft and Sirjan stations were employed. Also Arc GIS9.3 and ENVI4.8 softwares were used for image processing and analysis of spatial data.With regard to the relationship between temperature and precipitation with the present altitude morphoclimatic regions were recognized in the region , these regions were determined using Peltier(1995) Method.Cirques were distinguished using topographic maps, aerial photos and field survey. To carry out the investigation, descriptive method, field survey, and analytical methods were employed to study geomorphologic evidence of climate change. In this paper we focus on glacial and periglacial processes that are major geomorphologic agents in Bidkhan Mountain. According to tempreture gradiant and Peltier morphoclimatic classification method, present morphoclimatic in Bidkhan is semi-arid and arid. Based on Topographic maps, aerial photos, satellite images and field survey , 32 cirques were recognized (Table1) in the study area. According to the results of this method, snowline was located at 3095 meter. By using precipitation and tempreture current snowline is determined at 5500 meter. Congenital features in Bidkhan Mount hillsides were identified which are the results of cold and humid climate during past times and are used as paleoclimatic/morphological indicators. Reconstruction of paleoclimate of this region was determined through literature review of the data published for this region and other similar regions in the northern hemisphere in addition to using geomorphologic phenomena. Study of geomorphological evolution of the landscape of the region showed that the geomorphological features in mountain Bidkhan has been influenced by Quaternary climatic changes at least. Average snow line by right method is 3100 meter , however current snow line is 5500 meter according to tempreture gradiant. Based on the results of snowline determination and topographic features, average snow line on the northern and southern slopes, are respectively 3220 and 3129.13 meters, which show about 91 meters difference. Moreover, about 71% of ciques are located on the northern slopes that indicates the effect of topography on the formation of glacial cirque . According to the snow line in the last ice age glaciations, glacier and periglacier processes affected the study area. This is in contrast to current climatic data which shows the study area is affected by arid and semi arid morphoclimate. Additionally, one of the important reasons for the formation of glaciers in this mountain is the volcanic features and thick debris blanket on the surface of glaciers. Consequently, the formation of glaciers at these heights has been affected by the lithological conditions, as it has been affected by the temperature and precipitation changes.